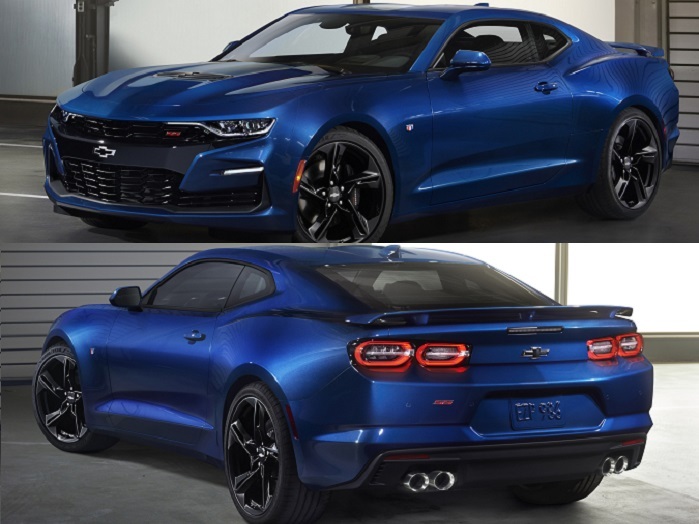 After lengthy speculation, the refreshed 2019 Chevrolet Camaro was introduced today with a new exterior design, a new transmission for the SS models and a new 1LE package that comes with the turbocharged 4-cylinder engine. We knew that a refreshed 2019 Chevrolet Camaro was coming, we just didn't know when. Many people including myself expected that it would be introduced at some big auto show where the company could put as many eyes on the refreshed car as possible, but instead, GM opted for a far simpler introduction. However, the refresh is far from simple, as Chevy looks to slow the sharp decline in muscle car sales. The biggest news with the 2019 Chevrolet Camaro is the exterior refresh, with significant changes across the front and rear end of the 6th gen car. As you can see in the picture above of the 2019 Camaro SS, the front fascia is far more aggressive, with more sculpting through the grille and fascia. Also, the SS "Flowtie" badge moves from the upper grille to the middle of the bumper area, with a paint scheme that blends the upper and lower openings. Also, compared to the LS and LT models, the SS has a larger lower grille opening, LED driving lights and a new vented hood. Out back, all of the 2019 Camaro models get larger, rounder taillights that will stand out from the current models, but overall, the rear doesnt change all that much. In addition to the unique exterior design, the 2019 Camaro SS gets a few performance upgrades in the form of the 10-speed automatic transmission from the ZL1, as well as launch control and line lock. The 6-speedf manual is still standard on all models including the SS, but those buyers opting for the V6 or the turbo-4 still get the 8-speed automatic as an option. The biggest news on the non-SS front is the arrival of the 1LE performance package for those Camaros fitted with the turbocharged 4-cylinder engine. For 2018, the 1LE package is only available for the V6 models as well as both V8 model (SS, ZL1), but starting with 2019, buyers can get the turbocharged 4-cylinder mill with the 1LE upgrades. Features of this package include a sport tuned suspension system, Brembo brakes, summer performance tires on 20-inch wheels, a flat-bottomed steering wheel, optional Recaro race seats and two new driving modes - Track and Competition. While the 2.0-liter turbo is the least powerful of the Camaro engines, this new performance package should make the turbocharged models more appealing to buyers who want the smallest engine with the premium go-fast goodies. Unfortunately, there is no word on power increases, pricing or anything about the ZL1. We can expect pricing to be announced closer to the dealership debut and since there was no mention of power increases for any of the 2019 models - I will go ahead and guess that any increases will be minor at best. As for the Camaro ZL1, it will be interesting to see if this new styling language is applied to the 650-horsepower models, or if Chevy plans to leave their supercharged beast alone for now. As a true Chevrolet fan, I have to say to Camaro the car before the refresh didnt appeal to the masses and didn't sell and they make it uglier. Camaro, you had your chance a totally missed the mark. Performance was always the best, but that wasn't even enough for sales, but we could have gotten a horsepower increase (thank god for the 10 speed) but the 10 speed should be in all the Camaros like Mustang did. We should have gotten a much better front and rear face lift to WOW the masses, not you got to be kidding. Really, that's all Camaro designers could do? no wonder there was this mediocre, quiet, no fanfare intro of a awful disappointing nothing refresh. You don't sound like a Chevy fan to me. You sound pretty rude. Can not give them away so make it uglier how could anyone that made the 69 z build this pos .Just like the all new chevy truck put a grill and new tail lights in and call it all new use some bail out money and hire some real car designers. It is said that the definition of insanity is, doing the same thing over and over expecting a different result. Time and again we have heard of a "refreshed" Camaro and I have been disappointed. I guess getting my hopes up for a truly "refreshed" Camaro has been my insanity. Expecting more, getting less and feeling disappointed. For me, I have two quintessential Camaros. The first, the 1969 Camaro Z-28 in hugger orange. Ah, the memory of the pony car days My second, is a 1970 1/2 Camaro Z-28 with the split bumper front end. I lament the fact that the 1960's to early 1970's will never be revisited when it comes to 2-door hardtops. Today it is pickup trucks (I have one) and SUVs......and electronic stuff and gizmos.